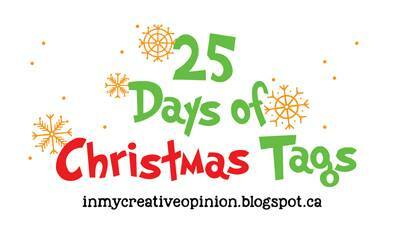 Hello friends, today I'm back to share some more tags for Tracey NcNeely's 25 Days of Christmas Tags event. Today's inspiration is from Sunny Studio Stamps. 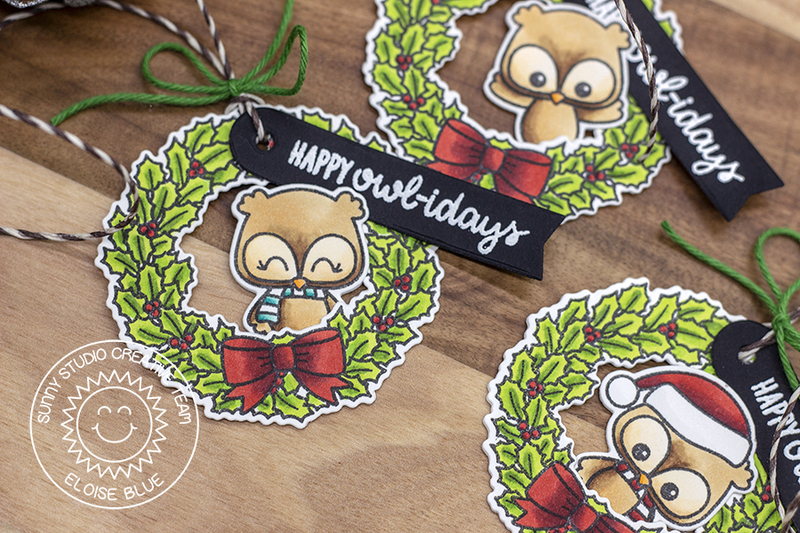 For my tags I decided to use the Happy Owlidays stamp set. I stamped all my images, coloured them with Copic Markers and die cut them all out using the dies. I also cut extra white die cuts for the backers. Once they were die cut out, I adhered them altogether using adhesive. I also adhered the white die cuts onto the backs of each of the tags, so they would be clean and have somewhere to write on. For the sentiment I white heat embossed 'Happy Owlidays' onto some black pieces and cut a banner end on each of them. I punched holes through the sentiment tag and also through the wreath. I threaded twine through and used plain twine to tie a bow on each. That finished up my tags for today, I hope you enjoyed them. I love creating tags from images like this - makes them super fun and unique. Make sure you head over to Tracey's blog for more information and inspiration. Oh my goodness Eloise these are precious. As always you have done an amazing job on your tags. Love how they are in the wreaths. Those mini owl wreaths are adorable tags! These turned out AMAZING Eloise. 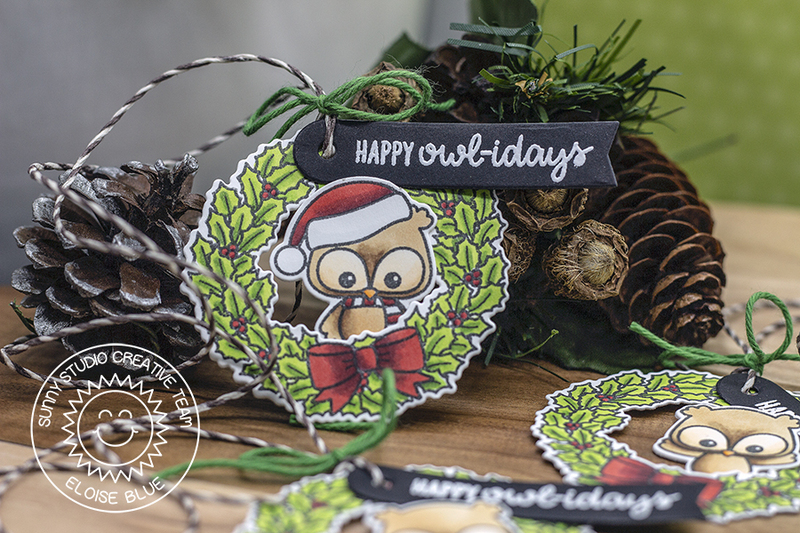 I love the idea of turning the wreaths into cute gift tags! Thanks so much for sharing your tags today. Darling little tags, Eloise. You really showcased these Sunny Studio products beautifully. Thanks so much for sharing and inspiring. These are darling!!! Love these cute owls peeking out from the wreaths. Your coloring is fabulous! Wow, amazing coloring and fabulous tags! Perfectly sweet and festive. This is an adorable set of tags, Eloise! The owls peeking through the wreaths are darling. Such cute and festive designs!